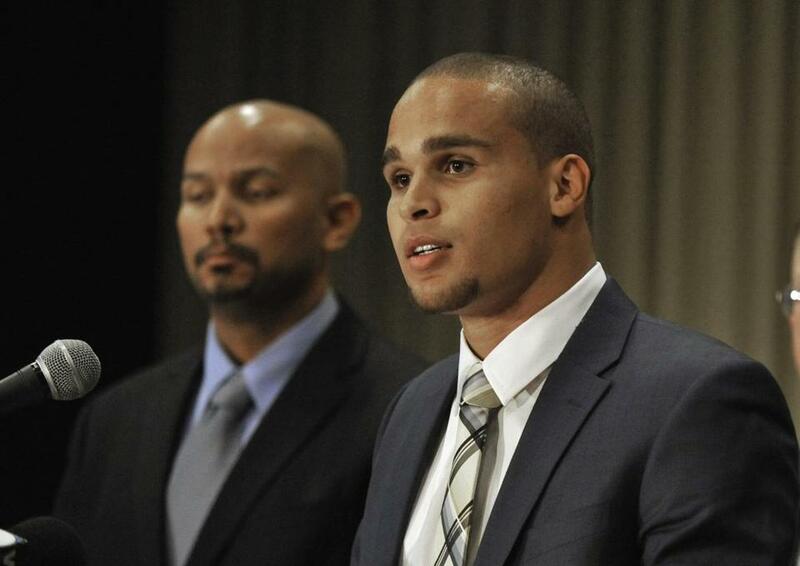 Northwestern quarterback Kain Colter led the charge for forming a union. CHICAGO — In a stunning ruling that could revolutionize college sports, a federal agency said Wednesday that football players at Northwestern can create the nation’s first union of college athletes. The decision by a regional director of the National Labor Relations Board answered the question at the very heart of the debate of the unionization bid: The football players who receive full scholarships to the Big Ten school, the agency found, do qualify as employees under federal law and therefore can legally unionize. ‘‘Based on the entire record in this case, I find that the Employer’s football players who receive scholarships fall squarely within [the] broad definition of ‘employee,’ ’’ Peter Sung Ohr, the NLRB regional director, said in his 24-page decision. An employee is regarded by law as someone who, among other things, receives compensation for a service and is under the strict, direct control of managers. In the case of the Northwestern players, coaches are the managers and scholarships are a form of compensation, Ohr concluded. The Evanston, Ill.-based university argued that college athletes, as students, don’t fit in the same category as factory workers, truck drivers, and other unionized workers. Immediately after the ruling, the school announced it plans to appeal to labor authorities in Washington. Those advocating for letting the players unionize argued the university ultimately treats football as more important than academics for its scholarship players. Despite Northwestern’s denials, Ohr sided with the players on that issue. The ruling also described how the life of a football player at Northwestern is far more regimented than that of a typical student, down to requirements about what they can and can’t eat to whether they can live off campus or purchase a car. At times during the year, players put in 50 or 60 hours a week into football, he added. The next step in the process of unionization would be for scholarship players to hold a vote on whether or not to formally authorize the College Athletes Players Association, or CAPA, to represent it ‘‘for collective bargaining purposes,’’ according to the NLRB decision. The specific goals of CAPA include guaranteeing coverage of sports-related medical expenses for current and former players, ensuring better procedures to reduce head injuries, and potentially letting players pursue commercial sponsorships. But critics have argued that giving college athletes employee status and allowing them to unionize could hurt college sports in numerous ways, including by raising the prospects of strikes by disgruntled players or lockouts by athletic departments. For now, the push is to unionize athletes at private schools, such as Northwestern, because the federal labor agency does not have jurisdiction over public schools. Outgoing Wildcats quarterback Kain Colter took a leading role in establishing CAPA. The United Steelworkers union has been footing the legal bills. Colter, whose eligibility has been exhausted and who has entered the NFL draft, said nearly all of the 85 scholarship players on the Wildcats’ roster backed the union bid, though only he expressed his support publicly. ‘‘It is important that players have a seat at the table when it comes to issues that affect their well-being,’’ Colter said. The NCAA has been under increasing scrutiny over its amateurism rules and is fighting a class-action federal lawsuit by former players seeking a cut of the billions of dollars earned from live broadcasts, memorabilia sales, and video games. Other lawsuits allege the NCAA failed to protect players from debilitating head injuries. NCAA president Mark Emmert has pushed for a $2,000-per-player stipend to help athletes defray some expenses. Critics say that isn’t nearly enough, considering players help bring in millions of dollars to schools and conferences. In a written statement, the NCAA said it was disappointed with the NLRB decision. ‘‘We strongly disagree with the notion that student-athletes are employees,’’ the NCAA said. The developments are coming to a head at a time when major college programs are awash in cash generated by new television deals that include separate networks for the big conferences. The NCAA Tournament generates an average of $771 million a year in television rights itself, much of which is distributed back to member schools by the NCAA. Attorneys for the CAPA argued that college football is, for all practical purposes, a commercial enterprise that relies on players’ labor to generate billions of dollars in profits.